“With Rafael Valls and Tomasz Marczynski we have riders who are specialists in that type of races where we didn’t perform in the past, stage races of one week." Today, Lotto Soudal confirms two new arrivals. Rafael Valls (28) and Tomasz Marczynski (31) will join the team. 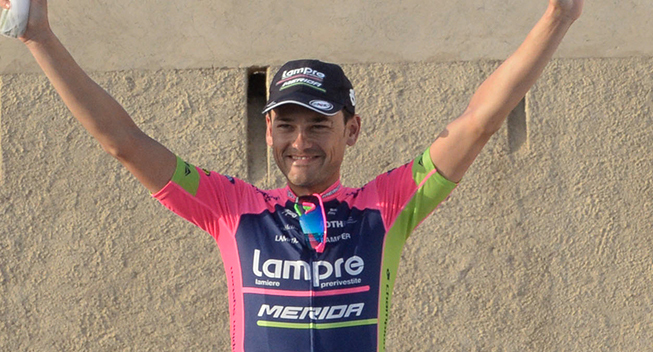 Spaniard Valls comes from Lampre-Merida and signs an agreement for two seasons. Pole Marczynski gets a contract for one year and leaves Torku Sekerspor. “Lotto Soudal offers me, with this two-year deal, a nice chance to take a step forward in my career," Vall said. "They give me the opportunity to prove myself in stage races of one week. It is this type of races that I prefer and so far I’ve also had my best results in such races. Next year as well, I will focus on this type of stage races. "My strongest point is my climbing capacity. I am still trying to improve my time trial skills as the races against the clock are often very important in stage races of one week. I really love riding in Vuelta al País Vasco, the Volta Ciclista a Catalunya and Paris-Nice. On the very top of my to-do list with favorite races there is the Tour de France, like most cyclists. “For the first time in my career I will ride for a Belgian team. I know Belgium a bit thanks to the Ardennes Classics and also from back in the days when I rode for Vacansoleil. I still know some Lotto Soudal riders (Kris Boeckmans, Thomas De Gendt and Pim Ligthart) from my period with Vacansoleil so it will be nice to ride in the same team again. "The Lotto Soudal team forms a strong unity, which really appeals to me. The riders support each other. When you see that, you want to be part of that team. This mentality will definitely stimulate me to pursue my goals and to focus on the stage races of one week." “Of course I’m very happy that I can sign a contract with Lotto Soudal," Marczynski said. "The last two years were not easy; during the season 2013 at Vacansoleil-DCM I underwent two surgeries and didn’t race a lot. The team ceased to exist and I had to take a step back. But I never gave up and always showed the ambition to come back to the WorldTour. And I succeeded after a good season at Torku Sekerspor. I think I have what it takes to play a role at this level. I’m very grateful that Lotto Soudal is giving me that chance and I hope we’ll both enjoy the collaboration in 2016. “What my role within the team will be, is still to be determined by the sports staff but the idea is to focus on stage races. But most important is that I can fulfill the expectations of the team and confirm the confidence they have in me. “With Rafael Valls and Tomasz Marczynski we have riders who are specialists in that type of races where we didn’t perform in the past, stage races of one week," manager Marc Sergeant said. "Both rode with Vacansoleil in 2012 and 2013, so they know a few riders and staff from our current team. "Rafael, with his 28 years is someone who is coming into his best years as a cyclist and will get the opportunity to go for an overall classification in this kind of races. In 2015, he was eleventh in the Dauphiné and eighth in Paris-Nice, both times in function of Rui Costa. He also achieved an eighth place in Catalonia and won the Tour of Oman. So during this year he proved more than capable to take WorldTour points. Next to our riders like Bart De Clercq, Maxime Monfort, Louis Vervaeke and Thomas De Gendt I am very confident that we will achieve better results and can race even more attractively. “In June, Tomasz Marczynski became Polish national champion for the third time. He’s a strong rider, the type that WorldTour teams need to assist the team leaders. Due to bad luck he had to take a step back, but this year he has re-entered the scene.